We refer our readers to an earlier article in which we discuss the nature of the Star of Bethlehem. In that post, we concluded that the “Bethlehem Star” was not an actual star (i.e. it was not a burning ball of gas many times the size of earth), but was a new phenomenon created (much as the Pillar of Fire was created to lead the Israelites out of Egypt). This point is affirmed in various ways by several of the Fathers of the Church (including St. John Chrysostom and St. Augustine), and by Fr. Cornelius a’ Lapide. Likewise, it does not seem at all likely that the sun itself “danced” or “fell towards the earth” or “grew in size” or “changed in color.” Indeed, it would seem that such events would be devastating not only for the planet of earth, but for many other planets in our solar system. 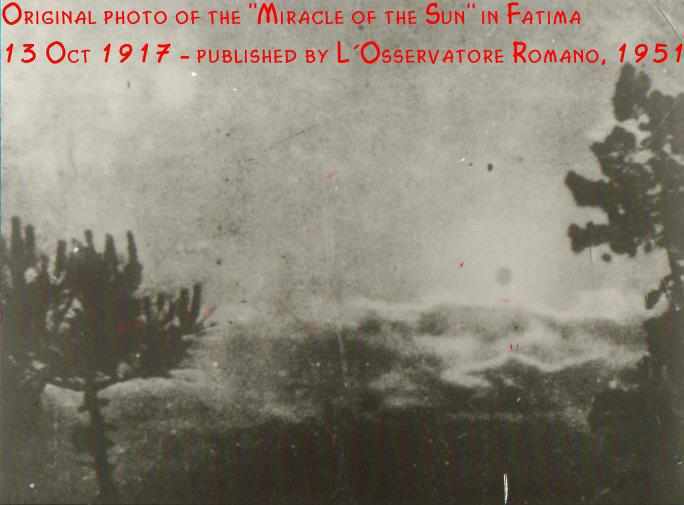 Moreover, although the Miracle of the Sun was witnessed by individuals several miles away from Fatima, it was not witnessed around the world. However, neither would it be rational to conclude that the event was nothing more than a “mass hallucination” – considering that there were between 30,000 and 100,000 people who witnessed the event (and some from as many as 18 kilometers away), it would be very hard to explain this miracle as nothing more than a mental phenomenon. Still, we do admit that some persons (both among believers and non-believers) present in the field that day saw nothing unusual at all. Therefore, it seems most likely that the sun itself did not dance or move from its place in the solar system, but that a new mass was formed in the sky and filled with an intense light. This illuminated mass also seems to have produced an intense heat. Still, the eyes of some were held from witnessing this real event – whether by demons or the divine will, we know not. This newly created atmospheric ball was moved (it seems) by angels and is most closely comparable to the Pillar of Fire or (perhaps) to the Star of Bethlehem. Positing the creation of this illuminated mass of particles – likely gathered from dust and the air, almost in the manner of an extremely dense cloud – the Miracle of the Sun does not in any way lose its miraculous and wondrous qualities. Rather, we see the immediate parallels between Fatima and the Pillar of Fire, and perhaps even the Star of Bethlehem. 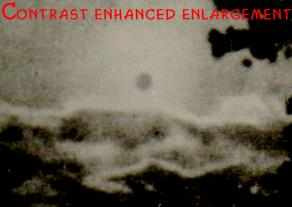 To claim that the Miracle of the Sun which occurred at Fatima on 13 October 1917 did not alter the sun but instead was the creation of a new illuminated atmospheric mass is by no means to downplay or reject the wondrous nature of the event. Rather, it is to recognize that Fatima is among those greatest of modern miracles, for it recalls the central events of salvation history – the exodus from Egypt and the nativity of our Savior. A reasoned approach to the Miracle of Fatima tells us that the sun itself did not dance or move, but we also can see the immediate biblical parallels which our Lady has evoked (especially, with the Pillar of Fire). This was truly a miracle of biblical proportions. “I feel incapable of describing what I saw. I looked fixedly at the sun, which seemed pale and did not hurt my eyes. Looking like a ball of snow, revolving on itself, it suddenly seemed to come down in a zig-zag, menacing the earth. Terrified, I ran and hid myself among the people, who were weeping and expecting the end of the world at any moment.” – Rev. Joaquim Lourenço, describing his boyhood experience in Alburitel, eighteen kilometers from Fatima. So glad this article reappeared. It's given me a new perspective regarding the Miracle of the Sun. I never realized I viewed this event in such a finite way. Somehow, I always thought of it as a special blessing meant specifically for those in attendance that day. Until now, I never viewed this miracle from an eternal biblical perspective. Thanks for making this event much more personal and reminding me that God's blessings are meant for all, for all eternity. I recall hearing somewhere that there were believers that did NOT see the miracle, and unbelievers that DID see. God introduces the 3D video game.? I guess miracles aren't rational, but I don't see why it couldn't have been sort of a mass "hallucination" phenom meant for whoever needed it. The Tower of Babel builders one day just all couldn't understand each other. Couldn't be explained. But what do I know. How do you explain the drying of the ground and the clothes of the people if it was a mass hallucination? Was the rain then a hallucination, too? It is quite certain that this was no mere hallucination. As Philip M. mentioned (and as I stated in the article) there are simply too many external elements of the event for it to be a purely mental phenomenon. This is why I would argue that angels gathered matter from the air (after the manner of a very dense cloud) and filled this with light and heat ... such that it looked like the sun. I too have heard that some did not see the miracle (even among believers). -- I mentioned this in the article. I suspect that demons somehow blinded certain individuals (even some believers) in order to induce some level of doubt. This would, of course, have been allowed by divine providence (I do not know why, but I trust that God has his reasons). The fact that the "miracle" happened at the exact time and day that was predict, in itself is unexplanebla, Also the fact that the soaked, mudded ground was dried up in 10 minutes....it was calculaded that it would take the energy of a 10 mega ton bomb to produce the same energy to dry up the ground...faith and reason go together. Forgive me, I didn't mean hallucination. I meant when God causes people see things others don't, like Bernadette saw Mary at Lourdes and no others did. Like on the road to Emmaus, Jesus there talking with them but they didn't know it was Him. No worries ... I like connecting the Sun Miracle with Emmaus more than with Lourdes -- since, Mary also appeared at Fatima in a way that only the children saw. The Sun however was witnessed by nearly all the people who were there. What do you think about the views of OSB Stanley JAKI (theologian and physicist) ? In his book "God and the Sun at Fatima", 1999, he tries to explain the "miracle" by a rare natural atmospheric phenomenon. Its meteorological arguments are not at all convincing (I am a retired scientist too). Finally he reduces the miracle to the fact that the meteorological event was precisely predicted for noon! About his thesis Wikipedia write: "Jaki believed that the event was natural and meteorological in nature, but that the fact the event occurred at the exact time predicted was a miracle." A very little one ! Today my wife and a pilgrimage group of thirty returned home after the October 13th anniversary. Believe me, our statue of Our Lady of Fatima and the three children has taken on a new significance in my life. To become closer to Jesus, revere Mary. Holiness is in the air in Fatima. I ope that the serenity I acquired will endure.